I decided to write about the Korean drama which I watched during my school days because of the recent trip to Taiwan. 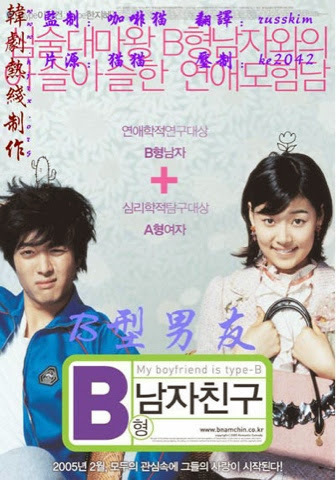 While resting in the hotel, iceprinxess and I watched a Korean movie - My Boyfriend is type B.
I remembered watching this romance-comedy movie during my school days and absolutely love it even though the movie was cheesy and illogical at times. That was a movie starring former lovebirds Lee Dong Gun and Han Ji Hye whom I rooted for in the past. Time files and now when I watched the movie again, all the past memories came streaming back. Those were the days when Korean drama was not as popular and widespread as compared to nowadays. Here are some of my ten cents worth of my reviews on these Classic Korean drama. Beginning from the earliest drama which left a deep impression on me. Storyline: Jang Hyuk acts as a rich and proud man Han Gi Tae. Jang Na-ra (Cha Yang Soon) is a cheerful and innocent country girl who carries the burden of her irresponsible parents. Han Gi Tae was betrayed by his uncle and cousin leading to his down fall. Cha Yang Soon help him to pick up the pieces. Like: I like Jang Nara character in this drama. Her chemistry with Jang Hyuk was good despite their age gap. Those were the days when Jang Nara was so popular and her cutesy image left a great impression on me. I am rooting for Han Gi Tae to get back to his feet and defeat the villains. This is a story about greed and a lesson on life - Right attitude goes a long way. Cha Yang Soon cheerful personality and never give up attitude makes the drama all the more interesting. Dislike: Certain parts may be chessy or impractical such as how Yang Soon have to tolerate her parents and the possibility of the main leads first encounter in a bath tub? Despite the flaws which I overlooked easily, I still enjoyed the drama. Storyline: Song Yi (Jang Nara) is a kind hearted girl with a bad temper. She was tricked and humiliated by her 'best friend' Hee Won as a child. People thought that Hee Won is a kind angel, whereas Song Yi is a evil child. When she is jobless, Hee Won offer her a job in the amusement park. Song Yi meet her childhood crush Hyun San (Kim Jae Won) in her workplace. On the other hand, Song Yi caused a train to caught fire accidentally. She managed to rescue Seung Joo (Kim Rae Won), son of the president of the park. Like: The two handsome leading men who happens to have almost the same names. Kim Jae Won and Kim Rae Won are charming in their own ways. Jang Nara looks cute and have the chemistry with both actors. Dislike: I am a sucker for romance comedy that has a fairy tale ending. I just hate it when the ending is 'open ended' and Song Yi did not chose any of them. It was such a waste of time to chase this drama to see who will Song Yi end up with. It would have been better for Song Yi to chose one of them instead of 'playing' with the guys feelings. Her indecisive, wishy washy attitude was so annoying. Anyway, My Love Pazzi was a sweet drama with some major flaws. Storyline: Kang Tae-Yang (Kim Jung Eun) works in Han Ki-Joo (Park Shin-Yang house as a housekeeper in Paris. Their personality differs from each other and conflicts arises while they were together. However, they developed feelings for each other when Tae Yang agreed to be Ki-Joo fake girlfriend. His cousin Yoon Soo-Hyuk (Lee Dong Gun) carries a torch for Tae-Yang which created some rivalries and conflicts. Like: I was introduced to this drama by an auntie who work in a VCD shop. Yes, I was a little doubtful in the beginning but I changed my views subsequently. To my young mind, the concept of romance was based on drama. All I remembered about this drama is the romance. I don't particularly like or root for any of the characters but I have a deep impression on the lead actress Kim Jung-Eun. She looks very pretty in my opinion and she cries beautifully. Park Shin Yang did well as a rich and arrogant man. Dislike: However, the ending was a dismay because I would have expected more from this drama by then. Yes, the drama ended in a fairy-tale like manner but I was left scratching my head wondering what is the ending? Storyline: The story begins with an arranged marriage by the leads grandparents. Kwon Hyuk-Joon came from a traditional family and he is an achievement driven Procecutor. On the other hand, Yoon Jung-Sook ( Han Ji Hye) is a aimless and rebellious girl. They got married despite their great differences in personality, age gap and values in life. The story continue to talk about the problems they encounter after marriage. Like: Jang Na-Ra exaggerated acting style was refreshing to me when I first watched her drama. However, I hope her acting skills have more dynamic. I felt that her acting thread on the line of annoying and cuteness. In my opinion, that largely depends on her character in the drama. Han Ji Hye acting style is similar to Jang Na-Ra. She was fresh and raw as a main lead and it shows in the drama with her exaggerated facial expression. Her crying scene falls flat in my opinion and I felt that there was room for improvement in her acting. Years have passed and Han Ji Hye had indeed improved a lot in her acting skills. Lee Dong Gun does not speak much in the drama but his acting speaks volume. I like the way he glanced at Han Ji Hye and his quiet manner. His potential in acting was evident and it helps that he is charming and handsome. Worthy to note that Lee Dong Gun was 24 years old when he had to portrayed a 28 years old man in this drama series. The storyline is good and it touches on values, love and traditional customs. It was nice to see the leads transformation and progression in their journey of life. At the end of the day, I felt touched by the story and the love of the main leads which we know transcend to real life after this drama. Dislike: Han Ji Hye acting could be better but I am sure she gave her all in this drama. Storyline: The drama is about a medical student Lee Soo In ( Kim Tae Hee) and Law Student Kim Hyun Woo ( Kim Rae Won). They started dating while attending the same school but soon lost contact with each other when Lee Soo In left for voluntary mission (OEP) at the third world country. Kim Hyun Woo is an idealistic lawyer who refused to fight legal case for big corporates and insisted to defend the rights of the people who has no voice in the legal system. Alex Hong ( Lee Jung-Jin) was his classmate and he is an ambitious and brilliant lawyer. He had a crush on Lee Soo In. After they graduated, the three of them met in Korea and a love triangle ensued soon after. Like: I like the romance between Lee Soo In and kim Hyun Woo. As always, we will root for the righteous male lead who fights for the poor. Kim Rae Won is a good actor but in this drama, Kim Hyun Woo character was childish at first but gradually became better. Sometimes, he was annoying and even arrogant to a certain extent which he fortunately jumped out of it later on in the series. Kim Tae Hee is a 'pretty vase' and her acting skills have not improve much throughout the years. However, I did not find her annoying. She is just a plain actress who does not stand out in acting as a main lead. Her acting is mediocre at the best in this drama. Despite that, I still like the chemistry between the main leads. Dislike: Some parts of this drama was chessy and the main lead English was terrible for a Harvard student. I supposed they had tried their best to speak English in a foreign country setting. Certain parts was unclear and illogical such as why did Lee Soo In left Kim Hyun Woo. The legalistic terms and cases to fight was not particularly interesting or intriguing. Storyline: Kim Sam Soon is loud and brash but she is insecure about her weight. She does not like her old fashion name which literally meant 30 years. Sam Soon has a talent for baking and her passion is desserts. Jin-Heon (Hyun Bin) is the son of a wealthy man. He opened a French restuarant and hired Sam Soon as the baker. Both of they fall out of love in their previous relationship. Jin-Heon assumed that his ex girlfriend Hee Jin deserted him after an accident which turns out to be a misunderstanding as Hee Jin was diagnose with stomach cancer. Jin-Heon and Sam Soon gradually fall for each other although they pretended to be lovers at first. Now, what is Jin Heon choice? Like: Kim Sun-Ah sacrifice a lot in this Korean version of Bridget Jones diary. It was not easy to gain so much weight and lose it so fast after the drama. Anyway, this drama deserved the awards and popularity. It makes the budding success of Hallyu craze which continue to intrigue interest after all these years. Back to this drama, I like the way the story touched on the sensitive issue of overweight and the social perception of these 'social outcast' since they were considered 'ugly'. In the society, people look at appearances and overlook the inner part of a person. These people were often regarded as being left on the shelf which gets worse if they reached 30. I like the approach of this drama touching on these social problems. Dislike: All of the actors and actresses in this drama were fine but only Kim Sun-Ah stood out from the rest. Hyun Bin had chemistry with Kim Sun-Ah and that is about all. The story is again about pretend lovers falling in love after getting to know each other. That plot was getting repetitive and what are the chances of this type of occurrence in real life? Only in Korean drama land. Storyline: Han Ji-Eun (Song Hye-Kyo) is an inspiring scriptwriter that lives in a house called Full house left behind by her late father. Ji-Eun was deceived by her two good friends thinking that she had won a ticket for a vacation while her friends plotted to sell her house behind her back. At the airplane, Ji-Eun meets a famous actor Yong-Jae (Rain). After a series of comedic situation, they reunited again. That was when Ji-Heon realized the truth that her house was sold to Yong-Jae. In exchange to buy back the house, Ji-Heon agreed to be his maid and be his contract lover. However, love blossom between the two of them. Will their love overcome all the obstacles? Like: I am attracted by the romance and the cuteness of this drama. Rain and Song Hye-kyo has great chemistry. The OST (original soundtrack) was great and I like all the light-hearted moments. Dislike: To be honest, the storyline of this series was very simple. The drama succeed in bringing laugher and cuteness, and that is about all. Nothing to think deeper and everything were predictable. Storyline: Shin (Ju Ji-Hoon) is the crown prince of a monarchy. He is getting married to Chae-Kyeong ( Yoon Eun Hye) through an arranged married made by their parents. Shin still love his ex girlfriend Hyo Rin (Song Ji Hyo). On the other hand, Shin's cousin Yul (Kim Jeong Hoon) had his eyes on his throne and his wife. Like: The chemistry between Shin and Chae-Kyeong. They have some couple moments which were so sweet!! I am just waiting for the moment Shin realized that Chae-Kyeong has always been there for him. Finally, they are together and I am happy with that. There were some fun moments every now and then. Dislike: Too many draggy moments. They keep repeating itself in a few episodes. There were a few times I wanted to slap the main leads. For instance, Shin for being so rude to Chae Kyeong and chose Hyo Rin. I like Yul in the beginning and thought that he was nice but he is getting too depressed in every episodes. Chae Kyeong cries too much in this series which was a little annoying. As for Hyo Rin, I wished to kick her faraway for being such a nuisance.